Shamsul Islam a prolific writer on Yahoogroups has translated from Hindi the RSS's reaction on Sikh Genocide of Nov. 1984. Nana Deshmukh who authored this document has squarely blamed Sikhs themselves for the genocide. He says no prominent Sikh has condemned killing of Indira Gandhi. That shows he didn't consider Congressite Sikhs as Sikhs. He says that it was unfortunate that at places the Sikhs defended themselves. He says they should have silently tolerated the attack. He believes the present form of Sikhs i.e turban, hair, kara, kirpan etc was given to them by the British and that it was no longer required. He is pained to know that the Sikhs compared Indira Gandhi with Ahmed Shah Abdali. He eulogises Indira Gandhi as the leaders who had strength to intigrate India. It is generally believed that the Congress cadres were behind this genocide. This is true but there were other forces too which actively participated in this massacre and whose role has never been investigated. Those who were witness to the genocide of 1984 were stunned by the swiftness and military precision of the killer marauding gangs (later on witnessed during the Babri mosque demolition, burning alive of Dr. Graham Steins with his two sons and recent pogrom of the Muslims in Gujarat) who went on a burning spree of the innocent Sikhs. This was beyond the capacity of the Congress thugs. This document may help in unmasking the whole lot of criminals involved in the massacre of innocent Sikhs who had nothing to do with the killing of Indira Gandhi. This document may also throw light on where the cadres came from, who meticulously organized the killing of Sikhs. Nana Deshmukh in this document is seen outlining the justification of the massacre of the Sikh community in 1984. According to him the massacre of Sikhs was not the handiwork of any group or anti-social elements but the result of a genuine feeling of anger among Hindus of India. This document also shows the true degenerated and fascist attitude of the RSS towards all the minorities of India. The RSS has been arguing that they are against Muslims and Christians because they are the followers of foreign religions. Here we find them justifying the butchering of Sikhs who according to their own categorization happened to be the followers of an indigenous religion. The RSS often poses as a firm believer in Hindu-Sikh unity. But in this document we will hear from the horse’s mouth that the RSS like the then Congress leadership, believed that the massacre of the innocent Sikhs was justified. Nana Deshmukh in this document is seen outlining the justification of the massacre of the Sikh community in 1984. His defence of the carnage can be summed up as in the following. 1. The massacre of Sikhs was not the handiwork of any group or anti-social elements but the result of a genuine feeling of anger among Hindus of India. 2. 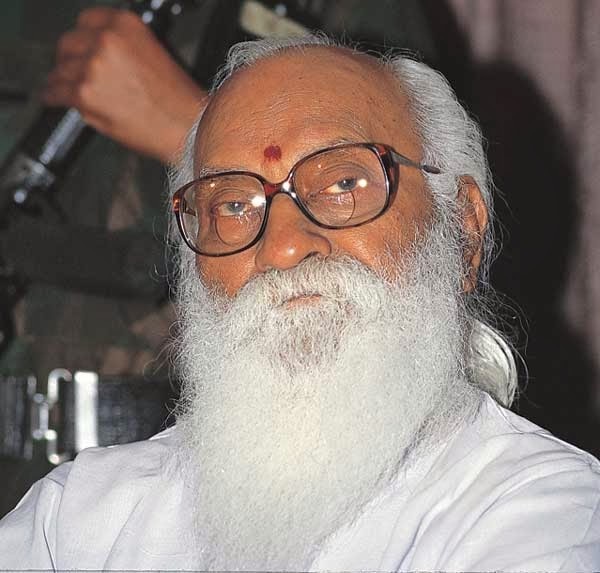 Deshmukh did not distinguish the action of the two security personnel of Mrs. Indira Gandhi, who happened to be Sikhs, from that of the whole Sikh community. From his document it emerges that the killers of Indira Gandhi were working under some kind of mandate of their community. Hence attacks on Sikhs were justified. 3. Sikhs themselves invited these attacks, thus advancing the Congress theory of justifying the massacre of the Sikhs. 4. He glorified the ‘Operation Blue Star’ and described any opposition to it as anti-national. When Sikhs were being killed in thousands he was warning the country of Sikh extremism, thus offering ideological defense of those killings. 5. It was Sikh community as a whole which was responsible for violence in Punjab. 6. Sikhs should have done nothing in self-defence but showed patience and tolerance against the killer mobs. 7. These were Sikh intellectuals and not killer mobs which were responsible for the massacre. They had turned Sikhs into a militant community, cutting them off from their Hindu roots, thus inviting attacks from the nationalist Indians. Interestingly, Deshmukh would not mind having militant Hindus. Moreover, he treated all Sikhs as part of the same gang and defended attacks on them as a reaction of the nationalist Hindus. 8. He described Indira Gandhi as the only leader who could keep the country united and on the killing of such a great leader such killings could not be avoided. 9. Rajiv Gandhi who succeeded Mrs. Gandhi as the Prime Minister of India and justified the nation- wide killings of Sikhs by saying, “When a huge tree falls there are always tremors felt”, was lauded and blessed by Nana Deshmukh at the end of the document. 10. Shockingly, the massacre of Sikhs was being equated with the attacks on the RSS cadres after the killing of Gandhiji and we find Deshmukh advising Sikhs to suffer silently. Everybody knows that the killing of Gandhiji was inspired by the RSS and the Hindutva Ideology whereas the common innocent Sikhs had nothing to do with the murder of Mrs. Indira Gandhi. 11. There was not a single sentence in the Deshmukh document demanding, from the then Congress Government at the Centre, remedial measures for controlling the violence against the minority community. Mind this, that Deshmukh circulated this document on November 8, 1984, and from October 31 to this date Sikhs were left alone to face the killing gangs. In fact November 5-10 was the period when the maximum killings of Sikhs took place. Deshmukh was just not bothered about all this. Deshmukh document did not happen in isolation. It represented the real RSS attitude towards Sikh genocide of 1984. The RSS is very fond of circulating publicity material, especially photographs of its khaki shorts- clad cadres doing social work. For the 1984 violence they have none. In fact, Deshmukh’s article also made no mention of the RSS cadres going to the rescue of Sikhs under siege. This shows up the real intentions of the RSS during the genocide. There is not a single sentence in the Deshmukh document demanding, from the then Congress Government at the Centre, remedial measures for controlling the violence against the minority community. Importantly, Deshmukh circulated this document on November 8, 1984, and from October 31 to this date Sikhs were left alone to face the killing gangs. George Fernandes while making this document public in 1984 wrote that it showed ‘Indira Congress-RSS collusion’. Nanavati Commission must investigate whether this collusion was confined to political sphere or went beyond to killing fields. Indira Gandhi ultimately did secure a permanent place at the doorstep of history as a great martyr. With her dynamism borne out of her fearlessness and dexterity, she was able to take the country forward like a colossus for over a decade and was able to build an opinion that she alone understood the realities of the country, that she alone had the ability to run the decadent political system of our corrupt and divided society, and probably that she alone could keep the country united. She was a great lady and her death as a brave leader had added to her greatness. She was killed by a person in whom she kept faith despite several complaints. Such an influential and busy personality was killed by a person who had the duty to protect her person. This act came as a blow not only to her admirers in the country and the world but also her critics. This cowardly and treacherous act of killing not only ended the life of a great leader but also killed, in the name of the Panth, the mutual faith of humanity. Explosion of sudden arson and violent hysteria throughout the country was probably a direction-less and improper expression of the hurt, anger and feeling of loss of her followers. Lakhs of her followers used to see her as the only defender, powerful protector, and a symbol of united India. It is a different matter whether this is right or wrong. For these innocent and uninformed followers, the treacherous murder of Indira Gandhi was the tragic culmination of the poisonous campaign of separatism, antagonism and violence conducted over the previous three years in which hundreds of innocents had to lose their invaluable lives and the sanctity of religious places was destroyed. This campaign assumed an ominous pace after the painful army action in June which, in the eyes of most of the people of the country, had become necessary to protect the sanctity of the religious places. Barring a few exceptions, the Sikh community observed silence for a long time on the barbaric massacres and heinous killings of innocent people, but they condemned the long-pending army action with anger and dangerous explosiveness. The country was stunned at their attitude. The army action was compared to the “gallu ghara” action of Ahmed Shah Abdali in 1762 to desecrate the Harmandir Sahib. Without going into the objectives of the two incidents, Mrs. Gandhi was pushed into the category of Ahmed Shah Abdali. She was termed the enemy of the Sikh panth and big prizes were announced on her head. On the other hand Bhindrawale who was guilty of heinous crimes against humanity in the name of religion was hailed as a martyr. Open display of such feelings in different parts of the country and abroad played a special role in increasing the distrust and alienation between the Sikhs and the rest of Indians. In the background of this distrust and alienation, stunned and bewildered people accepted the validity of the rumours of celebrations by the Sikhs at the heinous murder of Indira Gandhi by her Sikh bodyguards in retaliation of the army action. Of these the most hurting explanation was that of Giani Kripal Singh who being the Head Granthi considered himself to be the sole spokesman of the Sikh community. He said that he expressed no sorrow at the death of Indira Gandhi. This statement added fuel to the fire of boiling anger. No immediate and natural condemnation of this despicable statement by an important leader came from responsible Sikh leaders, intellectuals or organization. Therefore the already angered common and unimaginative people took it as correct that the Sikhs celebrated the death of Indira Gandhi. Because of this belief, selfish elements could succeed in making the common people become violent against the hapless Sikhs. This was a most explosive situation which needed utmost patience and skilful conduct on behalf of our Sikh brothers. I am saying this, being a life member of the RSS, because on January 30, 1948 a Hindu fanatic, who was a Marathi and had no relation with the RSS, rather was a bitter critic of the Sangh, committed unfortunate killing of Mahatma Gandhi. On this occasion we also suffered the sudden eruption of hysteria, loot and atrocities of misdirected people. We ourselves saw how selfish elements who were well acquainted with this incident, deliberately declared a murderer to be a member of the RSS and also spread the rumour that the RSS people were celebrating throughout the country death of Mahatma Gandhi, and thus they succeeded in diverting the love and the feeling of loss and hurt in the hearts of people for Gandhi. Such feelings were spread against Swayamsewaks and their families, particularly in Mahrashtra. Having gone through such experiences myself, I can understand the strong reaction and feeling of innocent Sikh brothers who became of victims of sudden eruption of people’s violent hysteria. In fact, I would like to condemn in strongest words the inhuman barbarity and cruelty on Sikh brothers in Delhi and elsewhere. I feel proud of all those Hindu neighbours who protected lives and property of troubled Sikh brothers without caring for their lives. Such things one being heard from all over Delhi. These things have practically increased the faith in natural goodness of human behavior and particularly faith in Hindu nature. ‘I direct all my Swayamsewak brothers that despite spread of provocation due to lack of understanding, they should adopt cordial attitude towards all and remember that this mutual distrust and improper hysteria is the result of the love and respect that the whole country has for Mahatma who made the country great in the eyes of the world. We salute such great respected departed soul’. These were not empty words to hide cowardice and helplessness in the hopeless situation. In those life threatening serious moments he proved that every word of his appeal had a meaning. On the evening of February 1, hundreds of Swayamsewaks in Nagpur urged for armed resistance and resisting till the last drop of their blood to stop the probable attack on their leader the same night. And some associates of Guruji told him of a conspiracy against his life and requested to shift his residence to a safe place before the attack, Guruji told them in such a black moment also that if the same people whom he had truly and with full ability, served throughout his life wanted to take his life, then why and for whom he should save his life. Thereafter he cautioned them in stern voice that even if a drop of blood of his countrymen was shed in saving him, then such a life would be useless for him. History is a witness that lakhs of Swayamsewaks spread throughout the country followed this directive word by word. Though they had to digest vulgarities in exchange of their patience and tolerance but there was a faith to give them patience that whatever may happen to them in present condition, history will definitely prove them innocent. I hope that in present difficult situation my Sikh brothers will also show the above-referred patience and tolerance. But I am deeply pained to know that rather than displaying such tolerance and patience at some places they have retaliated against the crowd with arms and played into the hands of such selfish elements who were eager to spread the trouble. I am surprised how a section of our society considered to be most disciplined, organized and religious, adopted such a negative and self-defeating attitude. May be they could not get proper leadership at the moments of such a crisis. Through my scanty study and understanding of Sikh history I consider that such a nonpolitical reaction of Sikhs in moments of such a crisis came from their complete involvement with teachings of love, tolerance and sacrifice of Sikh nature. Warrior nature of Sikh religion was a short time provision against barbarity of foreign Mughals which was taught by tenth Guru. For him Khalsa was a relatively small part of a broad Hindu-Sikh brotherhood and was designed as an armed hand to defend Hindu community and its traditions. Guru Govind Singh laid down for Khalsa followers five KS (Kesh, Kripan, Kangha, Kara and Kachha) and ‘Singh’ in the name of Khalsas. This was a symbol of their being soldiers. But unfortunately today these only are being projected as basic and necessary forms of Sikh religion. I am sorry to say that Sikh intellectuals too have failed to understand that conversion of Sikh religion into Khalsaism is a much later event and this was due to deliberate plan of British imperialists to divide and rule in Punjab. Its aim was to cut the Sikhs off from their Hindu environ. Unfortunately, after independence power hungry politicians kept alive for their own interest the unnaturally born problems of separation and equal existence, and carried forward the game of imperialists to divide and rule by their vote bank politics. This improper equating of Sikhs with militant Khalsaism is not only the basic root of separatist tendencies in some parts of Sikh community, but it also raised militancy and faith in the power of weapons to the level of religious worship. This religious worship gave rise to terrorist movement like Babbar Khalsa in the second decade and recently Indira Gandhi was killed as a result of terrorist wave under the leadership of Bhindrawale and a long ‘hit list’ is yet to be executed. I used to imagine that Sikh community has freed itself totally from illiteracy, ignorance, frustration and defeatism in which it was in the fifth decade of 19th century after losing its freedom and which was exploited by cunning British imperialists and selfish Sikh elites for their selfish interests. It is clear that in eighth decade Sikhs adorning the places of high responsibility represent highly educated, laborious, vigilant, relatively rich, enlightened and active section of Indian society in every walk of life. In nineteenth century their experiences and vision was limited to the boundaries of the then Punjab but today they are spread not only throughout India but throughout the world, and they are in a situation to directly know the conspiracies of big powers which are being hatched against independent and united India rising strongly in the world. In such an advantageous situation they should know their historical development as an integral part of India. Such a revaluation of history will give them the opportunity to see many wrong formulations of their own religion and past which has been systematically drilled into their brains by wrong and distorted historical writings by British administrators and intellectuals about nature and development of their religion. Such an attempt will take them to their real roots. This is the time that our Sikh brothers should search their hearts so that they can get rid of the false description inserted by British imperialists and power greedy opportunist people into their basic religious nature. Removal of such false descriptions is necessary to bridge the gulf of distrust and alienation between two communities of similar destiny, nature and similar traditions. I am afraid that without such a self-introspection and revaluation of history they would not be able to live with peace among themselves and with other countrymen. A disinterested analysis of their own enlightened interests will be enough to make them understand that their fate is indivisibly linked with the destiny of India. Such an understanding will save them from falling prey to the disruptive and destructive interests of foreign powers. I disbelieve (sic) that my Sikh brothers will accept the cautious words of spiritual expression of a well-wisher. Lastly, it is not to deny the truth that sudden removal of Indira Gandhi from Indian political scene has created a dangerous void in the Indian common life. But India has always displayed a characteristic inner strength in the moments of such crisis and uncertainty. According to our traditions, responsibility of power has been placed on the inexperienced shoulders of relatively young person in a lively and peaceful manner. It will be hasty to judge the potentialities of his leadership at this time. We should give him some time to show his ability. On such challenging juncture of the country, in the meanwhile he is entitled to get full cooperation and sympathy from the countrymen, though they may belong to any language, religion, caste or political belief. In the capacity of a nonpolitical constructive worker I only hope and pray that God bless him with more mature, balanced, inner strength and ability to give an impartial Govt. to the people so that he can take the country to real prosperous unity and glory.